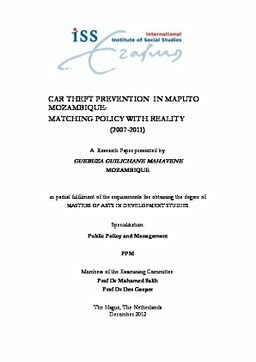 This research is a study of car theft prevention in Maputo-Mozambique (2007-2011). The aim of this paper is to explore how suitable the current crime prevention policies on car theft are for public safety in the Maputo Municipality. It aims at critically analyzing how information about car theft is managed and operationalized in methodological approach of crime prevention policy. This came about because Maputo Municipality has been ranked on the top list of cities with high rates of crime and car theft is one of the most common of-fences in Maputo Municipality. Efforts to tackle the problem are still unsatisfactory. No scientific research on car theft has ever been conducted in Maputo Municipality, thus the objective of this study is to contribute in this field. Data collection consists of, both qualitative and quantitative methods. An exploratory method consisting of a literature review and materials related to the topic have also been used. Furthermore in-depth interviews and semi-structured interviews were conducted involving senior police officers; junior police officers and local authorities. In addition, a questionnaire has been ad-ministered to the citizens of Maputo Municipality. Lastly an observation technique has been used. The results of the research were partly surprising because it was found that there is not any specific plan or policy which deals with the issue of car theft crime prevention in Maputo Municipality. Car theft prevention efforts are only found within the big umbrella of crime prevention in the country. The environment in Maputo Municipality is particularly favorable for car theft crime, because there is an increased accessibility of unprotected cars, lower number of security systems and an inefficient parking environment. Looking forward to-wards improved crime prevention policies including car theft, this study suggests a new policy framework for dealing with car theft crime in Maputo. This strategy is knowledge based and consists of setting up an empirical database constructed through research as foundation for policymaking. The framework for knowledge-based policy through research on crime prevention should be dually sensitive to the environment in which crime occurs in order to avoid failure of matching policy to reality.